It was great to work alongside the staff at the Odubu and Imvepi clinics in Rhino Refugee Camp. They continue to work long hours providing care to a rapidly growing population of refugees entering northern Uganda from South Sudan and DR Congo. Patients continue to come early every morning to wait for treatment. I was proud that our pharmacies are well stocked and that patients are always greeted by someone who speaks their language (11 spoken in the area) and provides care to them in a culturally respectful way. Becky Watson and I are both nurses. We met with the selected village health leaders in the area of our Odubu clinic. 27 of them represent all the tribes in the area including Dinka, Nuer, Kakwa, Acholi, Moru and Baka from South Sudan along with Lugbara from northern Uganda. Currently there is no DR Congo representation. These men and women are excited about serving their respective communities but lack education and supplies. In previous Global Refuge projects, we have trained "medics" to educate the population about how to prevent malaria by sleeping in a mosquito net and how to treat minor diarrhea in their children by making a homemade rehydration solution consisting of salt, sugar and clean water, etc. This strategy works well in displaced populations due to many factors. First of all, many of these settings rely heavily on information being passed along verbally, so once someone learns something new, they share it with their family, friends and neighbors. Secondly, people living in these situations of displacement have no idea how long they will be living away from their home without the usual medical care, so they need the skills necessary to be self-sufficient. Maybe most importantly, regardless of the effects of war, no one can take away someone's knowledge or education. The village health leaders were very excited to meet and discuss what they are seeing among their communities in the refugee camp. Many of the representatives from the South Sudanese tribes had only been in Uganda for a few months. They are eager to help. They spoke of needing a way to transport very sick people to our nearby clinics and also how to discourage people from making the long walk if they weren't suffering from something serious. Some among the Lugbara tribe received a basic training from the Arua District in Uganda in 2016, but very few malaria test kits and malaria medications were given. 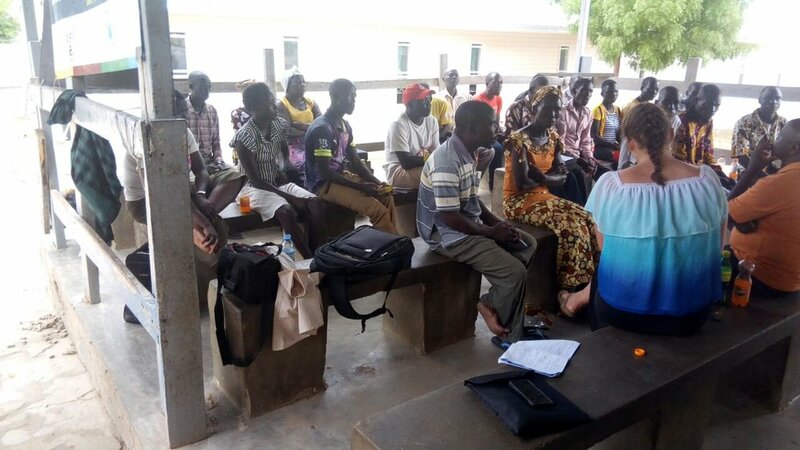 We all discussed the training they desired and the supplies they needed to better expand this health system into the far reaching corners of the massive refugee camp. These men and women were hopeful. There was obvious hope in their eyes that they could affect their communities in a positive way while growing and being challenged personally. The fighting in their home countries, the long journey to a "safe" place, and their uncertain future had not robbed their hope for a brighter day tomorrow. We were also hopeful. Our African staff members are anticipating how to expand our services more effectively into the communities. In the coming months we will be training them and hopefully many more to better educate their communities on health practices and disease prevention while testing and treating basic illnesses that can be deadly if untreated. This will relieve some of the burden on Global Refuge's health clinics while empowering the communities. Dr. Nowland: AKA, "Dental MacGyver"